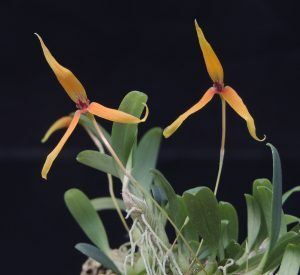 Following on from yeasterday’s monster, Bulbophyllum eberhardtii, we have one of our miniature bulbophyllums flowering today. Flowers are 4cm across and very large relative to the size of the plant with its single 2cm leaves and tiny pseudobulbs. We grow the species mounted and it scrambles around forming a mat or ball of plant over time. This species is attractive when not in flower because of the grey green soft leaves.